While I'm getting prepared for the lipstick posts, I thought I would entertain you all with a little background on what I've been up to lately. As I've mentioned before, I create handmade perfumes--although the ingredients are not 100% all natural. 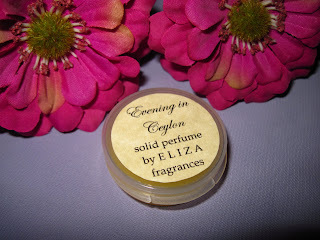 My perfume business is called Eliza Fragrances (click here to visit my Facebook page). Lately I've been intrigued by solid perfumes, and I'm thinking it may be something I want to specialize in. There are a lot of benefits of solid perfume, in relation to alcohol-based; they are more skin-friendly and better for the environment. The base of these perfumes is beeswax and jojoba oil. Below is an example of one of my solid perfumes. 'Evening in Ceylon' is a classic oriental perfume with notes of bergamot, carnation, mandarin, jasmine, amber, and vanilla. More information is available on my Facebook page, or you can email me at eliza.fragrances@gmail.com, or leave a comment here! all home made! Thats awesome! I think that sounds wonderful!!! Good luck. There cute! I can not wait to GIVE them AWAY!! :) THANK YOU!